The murder of her parents has left Silla damaged and lost, and Silla's insistence that her father is not to blame only alienates her further from her friends and family. When a mysterious spell book arrives, Silla hopes it will lead to some answers about her parents' killer. In her first attempt at magic, in an old graveyard near her home, Nick, the new boy in town spies on her; he recognizes the magic that Silla is performing as the same magic his mother performed with him, before she went mad. Before long, Silla and Nick connect, though Nick is unwilling to share his history with blood magic with Silla. When Silla's friends start showing signs of possession, Silla, Nick and Silla's brother, Reese, must contend with a deadly, immortal woman who will stop at nothing to take the book of spells from them. To start off with can I just say this was amazing! It’s such a magical, intense story and it just blew off my feet from the avid description to the magic. I have to say one of my favourite sections of the book was the diary of Josephine Darley. That part was very interesting to read and it didn’t let on who Josephine was because at the beginning I thought it was Nick’s mum. Another Favourite part, though, was the big fight between Silla and The Forest (Josephine). I loved the action packed scene. It was full of magic, love, hate, beauty and blood. It just blew me away. Basically the Story follows Nick and Silla, a couple, who have magical blood and can perform magic. The story basically follows how they come to terms with it and then fight evil magician Josephine Darley. The book is extremely well written. I don’t think there was a single point that left me nodding off, or skipping pages. It was all good and kept me thrilled, but a lot confused, but in a good way. This is one of those books I like to refer to as a ‘Puzzle Book’ because as you read on all the story slots together and makes a lot more sense. Speaking of how it was written, I loved it. 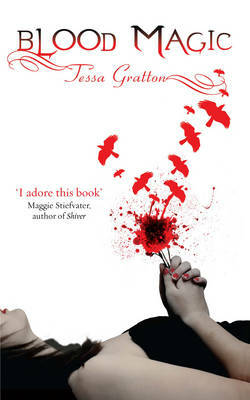 It was very blunt with everything but still had so much detail, but not too much, which sometimes happens with authors. The description is amazing. I could imagine everything perfectly and it was fantastic. My favourite character would have to be Josephine for this book with Silla in second place. Mainly because, I always seem to like the bad guys and she was absolutely drunk on magic (and me likes magic!). She was just a really crazed maniacal magician who really needed rehab and had this really feral personality. The book is exploding with magic and suspense. Full of everything I love, this book kept me bound by blood. So in other words, I truly loved it!